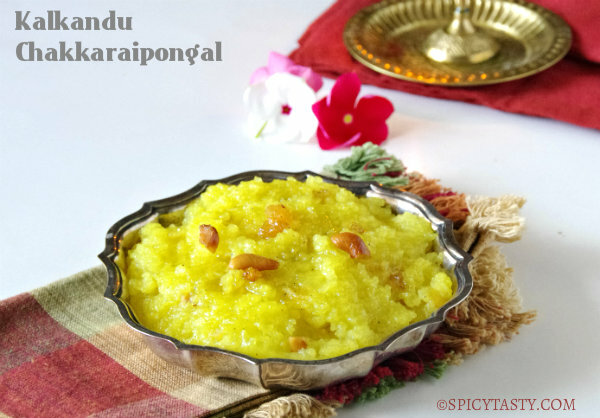 Chakkarai Pongal or Sakkarai Pongal is sweet rice pudding from India and is made during festival times (specially Pongal festival) and other special occasions. We can either add jaggery (unrefined whole cane or palm sugar) or sugar for preparing this dish. Today I have prepared this dish with sugar which is why it is called Kalkandu Chakkarai Pongal (crystallized Sugar Pudding). My mom makes it often since it is my dad’s favorite. She makes it in an open bronze pot (vengala paanai in tamil) which gives a unique and authentic touch to this dish. But my version is a pressure cooker and non stick pot method. Some people even prepare this dish in mud pot and it is amazing. I have always wanted to cook food in mud pots and pans. Hope I will do it some day. 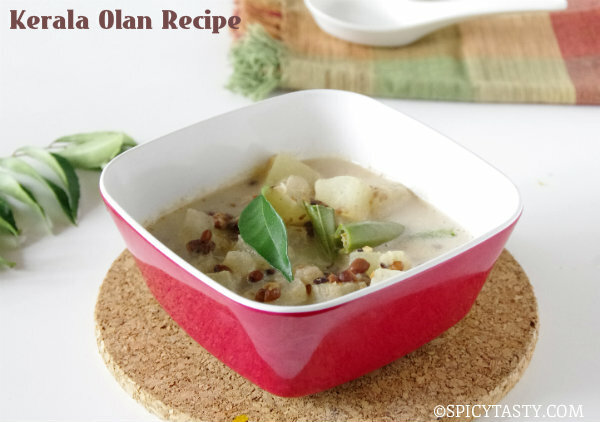 Okay coming back to this dish, it is one of the delicious and easy dish as well as wonderful to serve for any occasions. I made this dish for today’s Tamil New Year (Varusha Pirappu) and it came out so good. 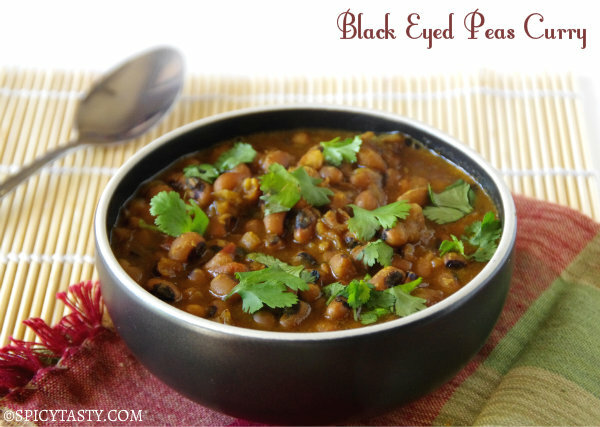 Try this dish and let me know your comments. Wash rice and dal and drain it completely. 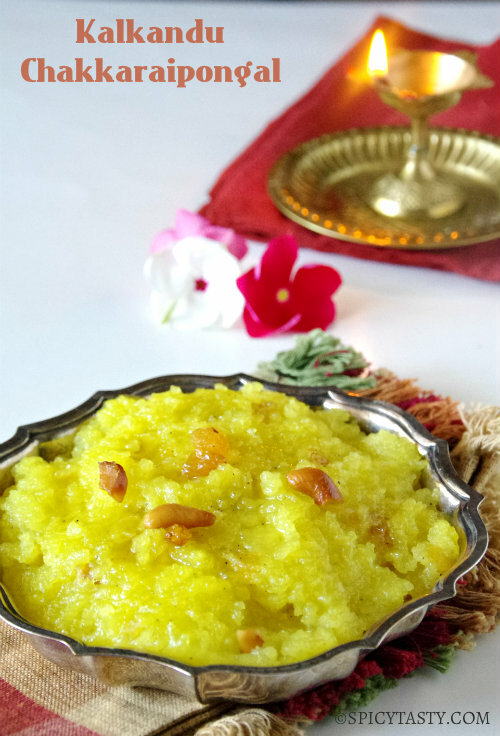 Heat a tsp of ghee in pan and add rice and dal and fry it for a2 minutes until it is nicely coated with ghee. Pressure cook rice and dal with 4 cups of water for 4 to 5 whistles. Add sugar and a little water to a pan over medium heat and keep stirring until one string consistency of sugar syrup is formed. Add ground cardamom. Mash cooked rice and add it to the sugar syrup and mix until a thick but flowing consistency is obtained. Add 2 tbsp of ghee and more if required. Mix well and remove from heat. Heat the remaining ghee in a small pan and add broken cashew nuts and raisins. When cashew becomes golden brown, add this to the prepared dish. Chakkarai Pongal is ready to serve.